Patrick Dykie marks his publishing debut with the release of “Simple Observations: A Humorous Look at the Absurdity of the World around Us” (published by iUniverse). The book shares a fun collection of short narrative stories dealing with people, places, things, animals and popular culture from everyday life. As a natural storyteller, Dykie, in his book, looks at everyday things and experiences in a funny way that everyone can relate to. He emphasizes how the book stays away from polarizing subjects such as politics and religion, and does not use profanity. It is family friendly and is appealing to many age groups. Much of the humor is self-deprecating, and never mean. Patrick Dykie graduated with a Bachelor of Arts from Lebanon Valley College. After a long career in the construction industry, he is now a full-time writer. He lives quietly in Reading with his wife Barb. He has two sons: Daniel, who is out on his own in a successful career, and Adam, a senior in college. 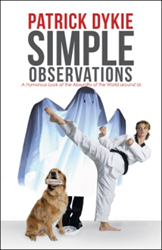 “Simple Observations: A Humorous Look at the Absurdity of the World around Us” is Dykie’s first published book.